manga paruppu.This recipe is done both in Andhra and in Tamilnadu.some add onion while pressure cooking.if u want to add onion,please add. Wash the mango,peel the outer skin.Chop into medium pieces. Wash the tuvar dal and soak for 10 minutes. Pressure cook for 3 whistles raw mango,tuvardal,green chilli by adding haldi, little gingely oil and water. Wait till pressure settles down and then mash it with the masher and add salt. Heat oil and splutter mustard,urad dal and chanadal to light brown and red chilli, curry leaves, chilli powder,hing. 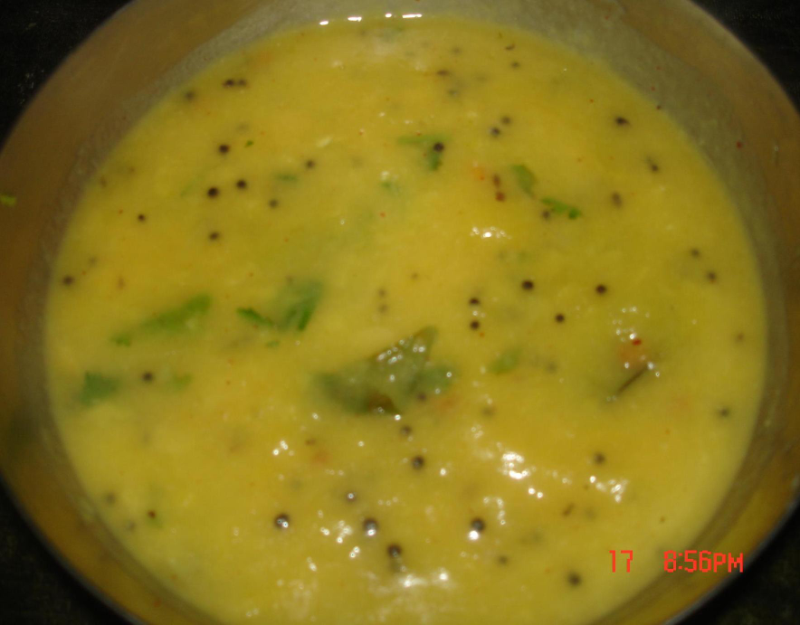 Add mango dal mixture.If u need water,can add water and cook for just 3-5 minutes. consistency should not be rasam.thick gravy type. Serve hot with rice and moor milaga (green chilli soaked in yoghurt and dried). Note:Depending on the tuvar dal please reduce or increase the whistle.I normally keep 3 as it will be mashed almost.my mom doesn't cook again.just add the seasoning to the mango dal.